We’re proud to announce with the general availability of dcTrack® 6.1.0, the latest version of Sunbird’s DCIM Operations software. Our biggest release yet includes VMware® cloud integration, enhanced 3D views, shareable links, and other features that enable hybrid IT and data center management. This dcTrack 6.1.0 update is available worldwide on a cabinet/month subscription or perpetual license basis to all customers with valid maintenance contracts. Simply download the update file from Sunbird’s support portal to upgrade today. The following features are new or enhanced in dcTrack 6.1.0 for an easy, fast, and complete second-generation DCIM solution. dcTrack 6.1 helps users identify and track server resources supporting virtual machines. It enables the discovery of supported assets in your virtualized environment by dcTrack, including clusters, hosts, and VMs. Multi-field search is available on the floor map, enabling you to quickly locate items in your data center. You can select up to five reports to enable on the floor map to make it easier for you to select the right location for your items based on common capacity constraints, such as space, power, and cooling. 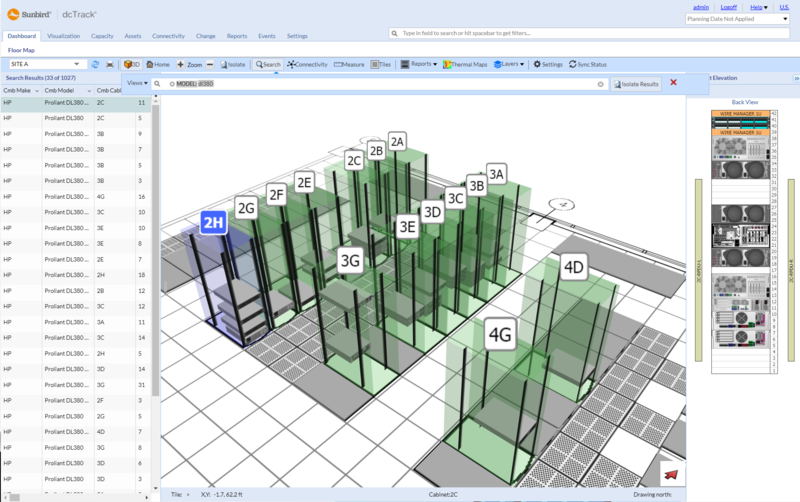 Cable connectivity can be visualized relative to other items on the floor map. This feature can be helpful if you want to determine what applications are supported by specific items and how they may be impacted by maintenance. The floor map in dcTrack 6.1 has been enhanced support for cable distance measurements and tracing so you no longer need to walk your data center floor with a tape measure. The Layers feature in dcTrack 6.1 enables users to show or hide the layers in their floor map drawing files to make better use of your AutoCAD or Visio drawings. Measurements can include vertical distance as well for extra accuracy. The Planned for Decommission feature allows users to indicate a date when items will be decommissioned and to make use of the resources that will become available when those items with the Planned for Decommission status are decommissioned. Once an item has a status of Planned for Decommission, its rack units will be included in the pool of resources available for planning the deployment of new assets based on the date the items are planned for decommissioned and the date that you are planning for. An item that is Planned for Decommission is assigned a Planned Decomm. Date, which is the date that you are expecting to decommission the item. For example, when using dcTrack Intelligent Capacity Search feature to find and reserve the optimal space, power, and network port capacity for your assets, you can apply a Planned Decomm. Date to include assets, even if you haven’t yet decommissioned them. You can also add multiples quantities of the same asset per cabinet and apply a project number for faster, more efficient capacity planning. The drilldown view of any dashboard widget has been enhanced with a donut chart of the data displayed in the Details Grid. This data can be grouped by make, class, status, and other attributes. It can also be aggregated by Average, Count, Maximum, Minimum, and Sum. You can now create your own lists by sorting and filtering data directly in asset list views, and can then save multiple list views so you can quickly and efficiently switch between your customized lists. Want to share your data with other dcTrack users? With a shareable link, users can copy and paste the link into other applications and share it with their team, without having to explain how to navigate to the specific page or define the exact search parameters. The link obscures any information that may otherwise be included in the URL that is not intended to be shared with all users. In dcTrack 6.1, the Models Library has been enhanced to provide Administrators with the ability to export select models and re-import them into another system as if models were being added or updated on the target system. As a result, users can stage model library updates and modification in a test or development system, not the production system, and can extract and upload the model library data separated from full database backup. For more information on what’s new on dcTrack 6.1.0, including Linux KVM as a supported platform, sensor management via CSV, HTML5 GUI enhancements, and our ITSM connector, check out the release notes. Ready to upgrade? Download the upgrade file on the support portal.